With all the essential features at an affordable price, the P48-W is a great choice for users looking to build a powerhouse while staying within their budget. 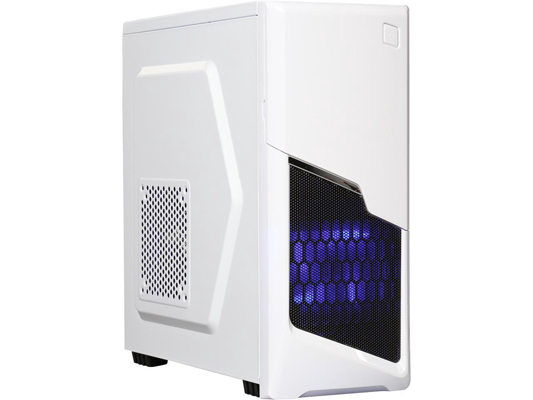 It accommodates up to ATX motherboard, and supports up to 160mm high CPU cooler, 375mm long graphics card and up to seven PCI expansion cards. One USB 3.0, two USB 2.0 and two audio jacks are located on top for easy access. Two pre-installed fans - one 120mm front blue LED fan and one 120mm rear LED fan - create horizontal air channel for efficient cooling. Its all black interior gives the case a high quality, professional feel, and the white exterior looks great in any modern homes. 7 PCI slots provide flexibility for multiple graphics cards solutions. 16.70" x 7.80" x 17.40"